I posted on Instagram a couple of weeks ago that the Thankful Forest Friends Stamp Set was going to be challenging for me. 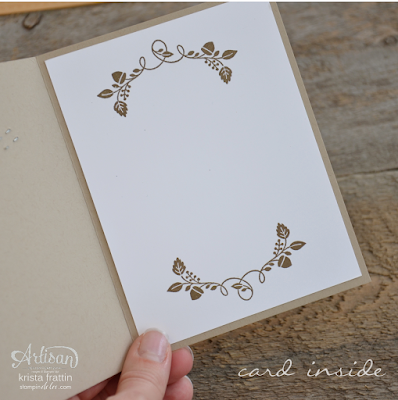 I am excited to reveal the card that I created with this cute set! 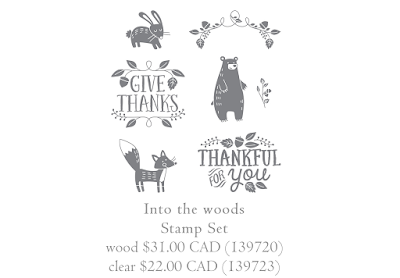 The Artisan Design Team is pairing this set with the Into The Woods Suite products today for our weekly Blog Hop! This post is special today because these projects are the highlighted monthly Artisan Facebook Project posting from Stampin' Up!. Sadly, this is our last monthly Facebook post as a team! How much do you love that little bear?! I am sure the ideas are endless for this stamp set .... to prove it click along the Blog Hop to see what the rest of the Stampin' Up! Artisan Design Team has created! Can you believe that the current design team only has two more posts remaining as a group?! Do not worry, a new design team will be coming your way in November to replace us. You will have to come to each of our pages and follow us come November. I assure you we all will still be blogging and sharing our crafty love!